Here is an enormous threat to the farm and cattle community coming to Western States. I recently identified ten major legal flaws of a proposed Tribal Water Compact, and identified them as the principle beliefs of Montana Senator Jon Tester. 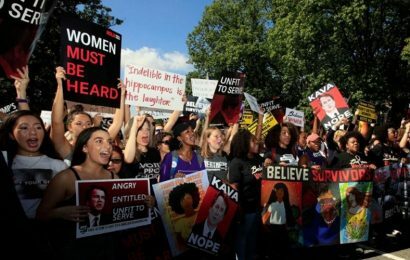 I would also include that these beliefs are supported by Montana Governor Steven Bullock, Attorney General Tim Fox, and a majority of the Montana Legislature. All of these elected officials have completely abandoned the state protections of Montana residents living in eleven counties of Western Montana. The Federal government is using tribes as willing pawns to federalize the waters of the Western States. The proposed CSKT Water Compact is the model, or pilot project to accomplish this goal. Unless State elected officials resume their duty to protect State authorities and resources, the federal government and tribes have smooth sailing for dismantling the balance of power between the federal government and states. Water is life on the land. Tribal financing of elected officials is greasing the skids to get this done on behalf of a continuously overreaching federal government. 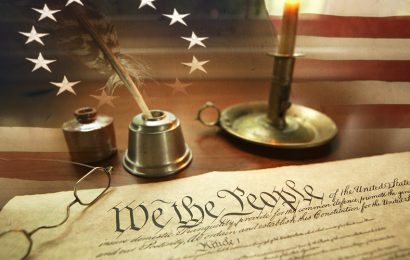 The U.S. Constitution is Irrelevant. Article IV provides full faith and credit to States, full privileges and immunities of citizens, and no new “states” created within a state. Governor Bullock signed away the First Amendment of Montana citizens, and executed an intentional violation of the Fifth Amendment (takings without compensation). Bullock ignored the power of the State of Montana under the Tenth Amendment, and removed the civil rights protections of Montanans under the Fourteenth Amendment, among other U.S. Constitutional violations. The Montana State Constitution is Flexible. The CSKT Water Compact tramples upon Article II and Article IX of the Montana State Constitution by removing the popular sovereignty and inalienable rights of Montana citizens, taking water rights attached to property deeds, and transferring off-reservation Montana waters to federal “trust” for an Indian tribe. Article IX requires “a clean and healthful environment in Montana for present and future generations.” Water is livelihood, or the lack of livelihood on land. Transferring authority over Montana waters to an Indian tribe that has no duty to Montana landowners is abhorrent. The CSKT Tribal Constitution is Insignificant. Article VI of the CSKT Constitution declares that the Tribal Council’s powers and duties are subject to any limitations imposed by Statutes of the Constitution of the United States. (See U.S. Constitution above). Further, Article VII of the Tribal Constitution provides a Bill of Rights that is substantially violated on behalf of enrolled tribal member landowners and irrigators within the Flathead Reservation, among other Tribal Constitution violations. The U.S. Court Rulings on Water Should Be Ignored. The Winters Doctrine of 1908 is a fair and just commitment to always provide water for all tribal lands, people and enterprises. The Winters Doctrine excludes off-reservation waters from tribal authority. The 1981 Montana v. U.S. ruling provides that tribal governments have no authority over non-tribal persons or properties, absent a person’s consent. The 2013 ruling in Tarrant v. Herrmann unanimously asserted that “States have the absolute authority over all navigable waters within lands ceded to a state upon statehood.” These are but a few of the very powerful U.S. Supreme Court rulings utterly ignored by the federal government, State of Montana and CSKT Tribe. Tribal Sovereignty Is Superior to and More Precious than State Sovereignty. 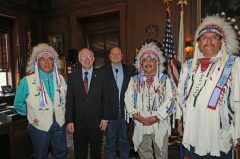 Two major tribal privileges have caused elected officials of the State of Montana to elevate tribal sovereignty over State sovereignty: 1) tribal governments directly finance incumbents and candidates. No other American governments may do so. Indian reservations place polling precincts on federal “trust” land, where the Secretary of State has no access or enforcement authority and cannot ensure fair election practices. Elected officials benefitting from these two egregious election conditions (money and questionable tribal votes) are loath to require the Montana Legislature to end these practices. Consequently, Montana elected officials say “Yes” to every tribal whim, even to the direct harm of state sovereignty and the protection of Montana citizens. The Federal Government, State and Tribe Must Steal Water Rights Attached to Private Property Deeds. The entire ability to implement the proposed CSKT Water Compact is contingent upon surreptitious and nefarious removal of private water rights, and illegally transferring such rights to the federal government on behalf of a tribe. This is theft. This is absolute unadulterated theft of a water right without compensation, and instrumental to the success of the CSKT Water Compact. Senators Tester and Daines, Governor Bullock and their minions believe that such a travesty is a justified harm to Montana residents. A Montana Senator’s Oath of Office Must Prioritize Tribalism. The Federal Government has a “trust” relationship with Indian tribes. States do not unless they intentionally self-impose a State “trust” relationship with Indian tribes. Montana did exactly that a couple of decades ago. See Item 5 above (candidate funding and questionable votes) to fully understand why Montana elected officials either cooperate with tribes or get taken out of office. A Territorial War Power against the State of Montana is the Right Way to Implement a Tribal Water Compact. On Page 2 of the Enrolled Bill (S. 262) passed by the Montana Legislature is the following: “The Secretary of Interior…has authority to execute this Compact…pursuant to 43 U.S.C. 1457…” This statute is a Territorial War Power that may be applied in federal territories, but never against a State. Montana elected officials either naively or intentionally agreed to this travesty. There has been no discussion or action by state officials to protect state sovereign authority specific to this Compact. Montana State Legislature is Subservient to a Senator’s Decisions. 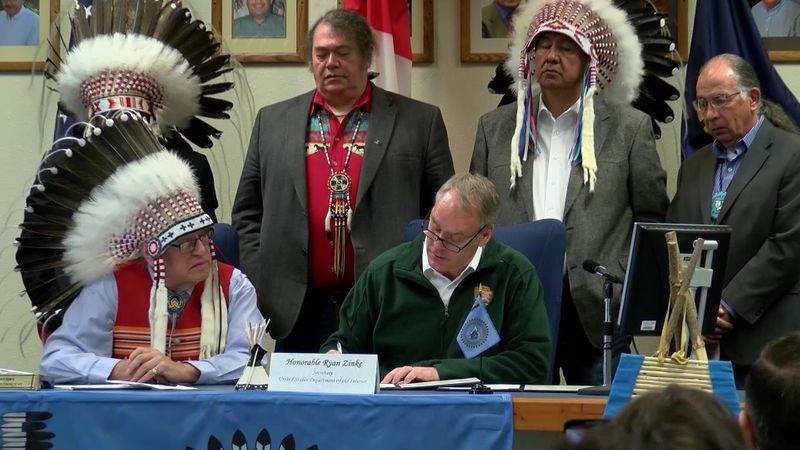 Montana Legislature’s bill, S. 262 was wrapped into and substantially amplified in Senator Tester’s Compact Bill, S. 3103, expanding tribal authority over Montana waters and adding multi-millions to the Compact, beyond what the Montana Legislature approved. Tester overruled and exceeded the decisions of the Montana legislature, with no complaint from Montana elected officials. Fortunately, Tester’s S. 3103 died in a Senate Committee in the last (not current) Congress. It will undoubtedly be resubmitted by Senator Tester, and/or Daines. Montana Waters Should Rightfully Be Owned and Managed by the Federal Government. The proposed CSKT Compact transfers the State’s authority over its waters in eleven Western Counties to the federal government, to be held in “trust” for a single Indian tribe. Should this Compact be ratified by Congress, all other Montana Indian tribes will demand the same water benefits as the CSKT tribe. 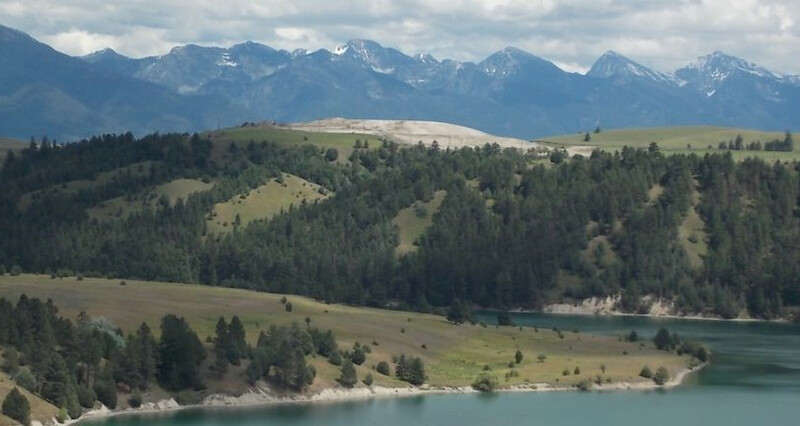 The end result will transfer all Montana waters to the federal government to be managed on behalf of Indian tribes in Montana. This is, of course, a horror story for the State of Montana, but it gets worse. Should this unique and highly illegal tribal water compact become law, the precedent is set for all tribes in their respective states to roll out the same demands. The Federal government is using tribes as willing pawns to federalize the waters of the Western States. The proposed CSKT Water Compact is the model, or pilot project to accomplish this goal.